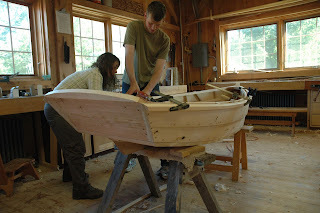 Some old and future news: Last September I taught a boatbuilding workshop for the first time in awhile. In fact the last time I taught was in 2007 at the Wooden Boat Center in Takashima, Japan, so I guess it was fitting that I went to the equally exotic locale of Pemaquid, Maine. 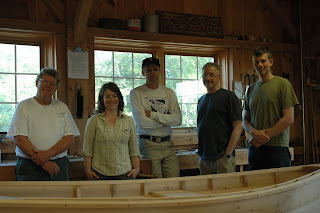 I taught a one-week workshop at the Carpenters Boatshop. 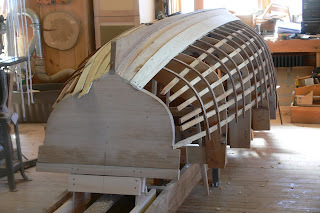 I took this photo of the Boatshop a few years ago when I was there for a lecture. Yes, its winter. 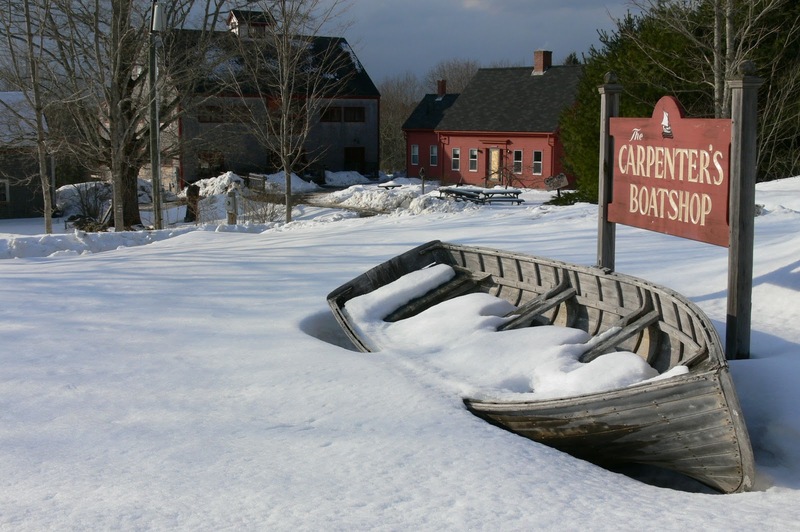 And yes, there are nice summers in Maine as well. 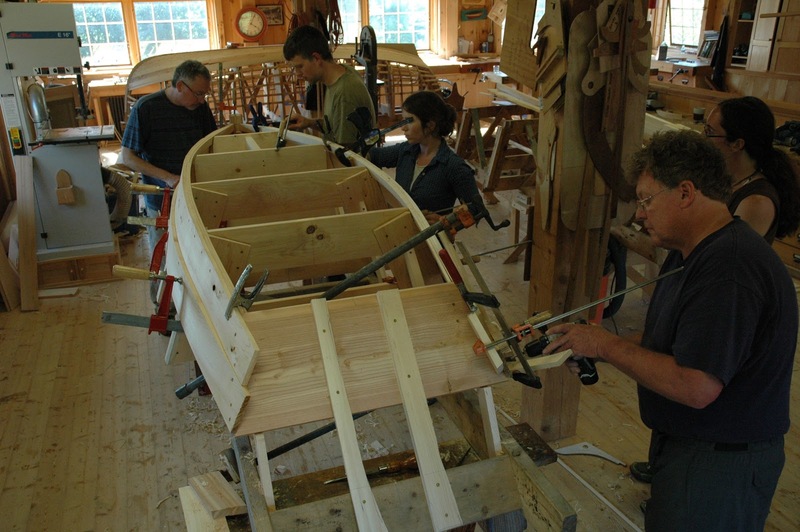 The Boatshop takes about a dozen apprentices a year for a nine-month course. The main boat used as a teaching tool is a nice bent-frame, lapstrake dinghy, the Joel White-designed Catspaw. In this one-week workshop we built a fairly straightforward flatiron dinghy. 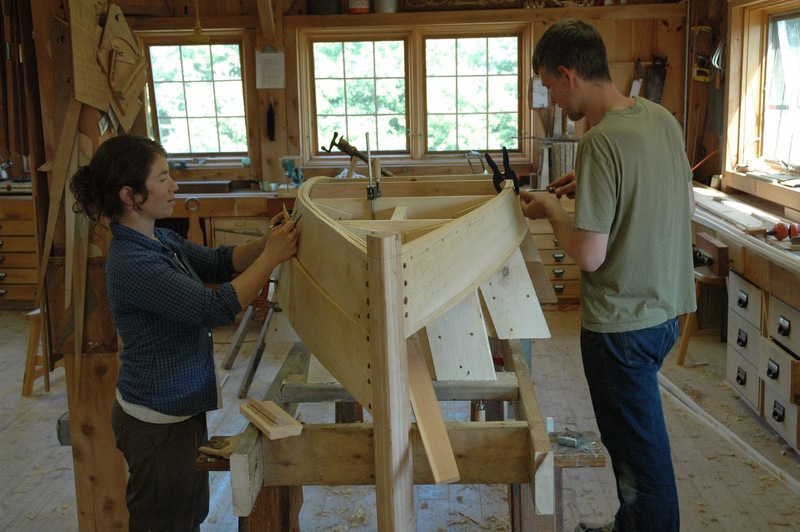 We lofted the boat's lines and several students made half models in the evenings. We also stressed sharpening hand tools, power tool safety, wood selection, steam bending among our elements of boatbuilding. We built the mould setup the afternoon after we lofted the lines. 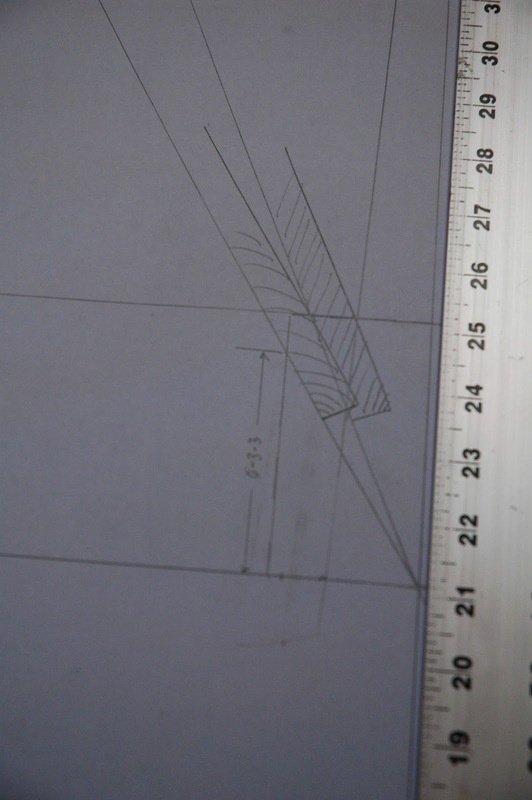 A detailed look at our lofting, showing our stem and stem rabbet. 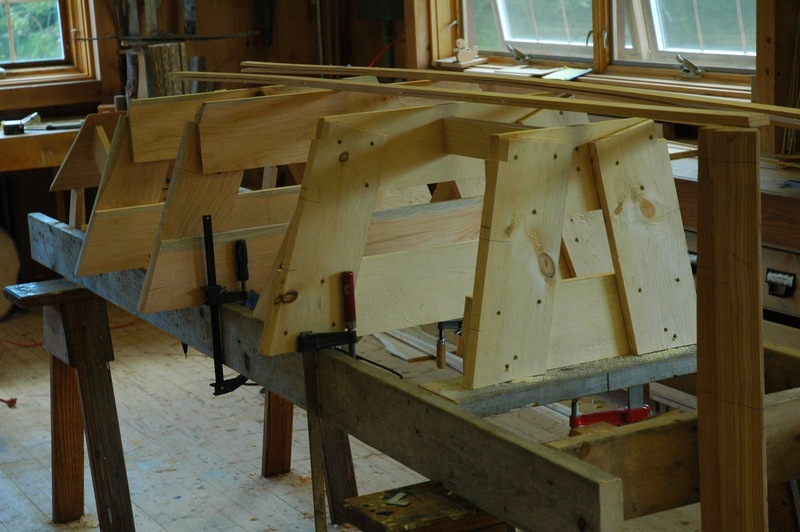 I decided we would plank the sides of our dinghy lapstrake. This gave students a chance to learn how to spile lapstrake planking and cut the gains and bevels required in this type of planking. 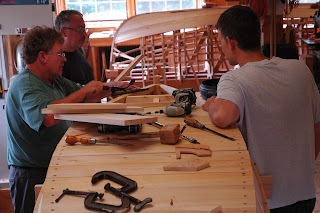 It also gave us a chance to learn how to use copper rivets to fasten the planks along the laps. 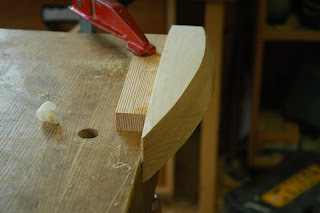 The bottom was cross-planked, which is carvel construction, so students got to learn how to plane a caulking bevel as well as some other elements of flat-bottomed construction. Traditional caulking is a "must learn" skill and the bottom of the dinghy provided lots of seams, giving everyone a chance to practice caulking. 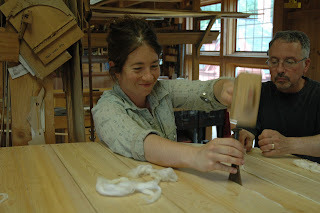 We used both caulking wheels as well as caulking irons. I found the lines for this dinghy in a reprint of Kunhardt's book. 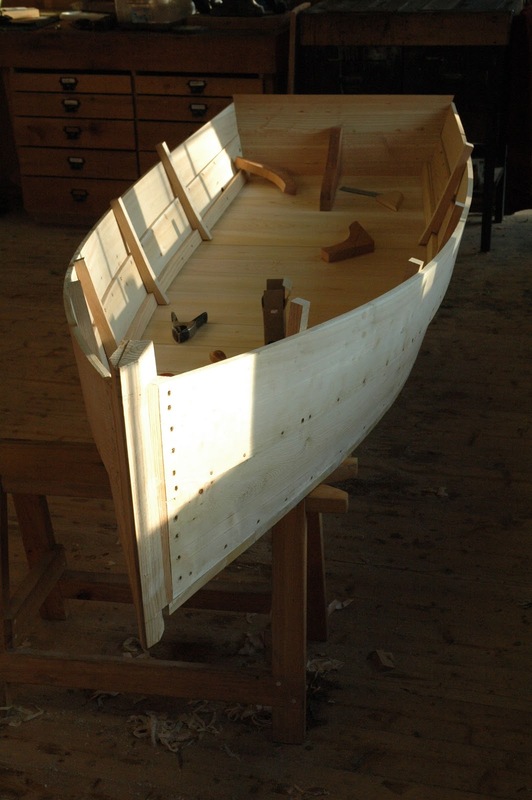 Its a really lovely little boat, with the emphasis on LITTLE. 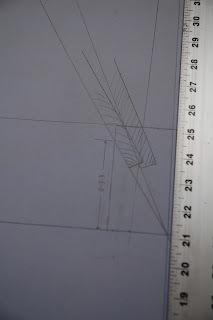 I plan on enlarging the lines before I build her again. This is as far as we got and the week ran out. 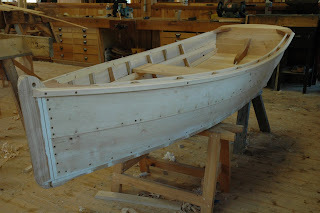 A Boatshop volunteer painted the dinghy after we left. 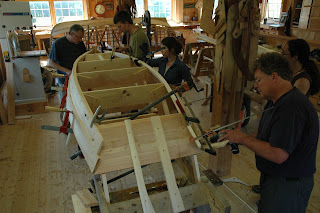 I am also scheduled to teach this class at Country Workshops in September of 2012. Please pass news of this course along and think about taking one of them yourself!